The burgundy velvet is printed with bursts of metallic silver. 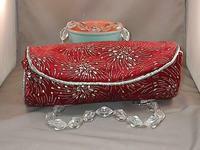 I've added matching silver trim, plus handles of vintage Lucite beads. The interior is lined with gorgeous dusty rose fabric. The bag closes with a magnetic snap. Suitable for day or evening use, it's another beautiful and versatile purse from SPARKLE PLENTY. Very innovative, both in styling and in colouration, this set is a knockout!